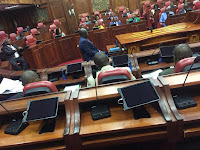 Thursday March 14, 2019-The newly nominated Education Cabinet Secretary, Prof. George Magoha, was on Thursday morning vetted by MPs in Parliament to determine his suitability to serve in President Uhuru Kenyatta’s Cabinet. During the session, Prof. Magoha disclosed that Interior Cabinet Secretary, Fred Matiang’i, was the one who recommended him to President Uhuru Kenyatta for the KNEC chairperson job and probably the CS job. He cited this after he was asked on what basis he chose his first referee on his CV who happens to be the Interior CS. “I want to declare that he (Matiang’i) is my friend but I did not appoint him as my referee on the basis of that, I appointed him based on the fact that this is a ministerial job which I never looked for and he has been one,” Magoha noted. “He is the one who recommended me to the president to go to KNEC, he would be able to tell you what I did when I was there,” he added. This comes even as Magoha sacked Matiang’i from the University of Nairobi for incompetence. The post Prof. MAGOHA now reveals the man who recommended him to UHURU for appointment as Education CS-It is ironical because MAGOHA sacked him before appeared first on Kenya News Alerts.